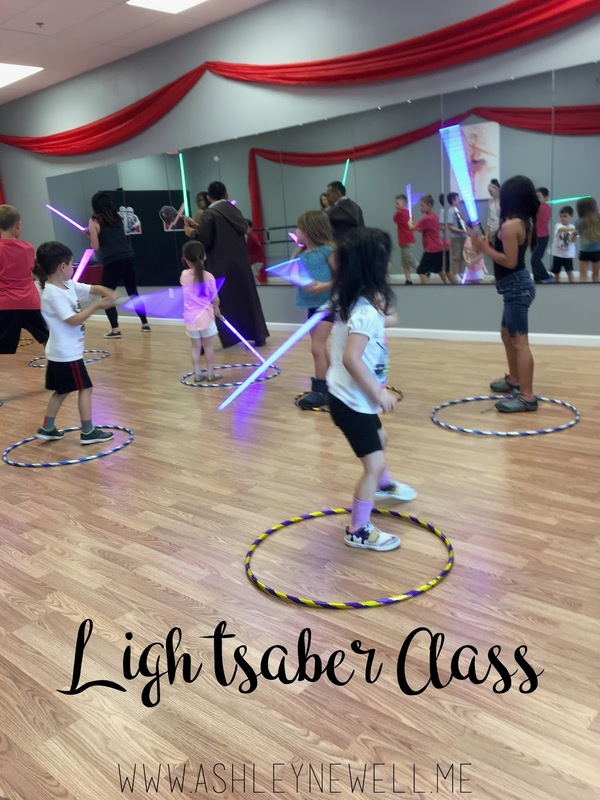 This year on the Big Day of Giving they hosted a Star Wars themed Light Saber choreography event. I signed all my kids up for this event and invited friends to join us. 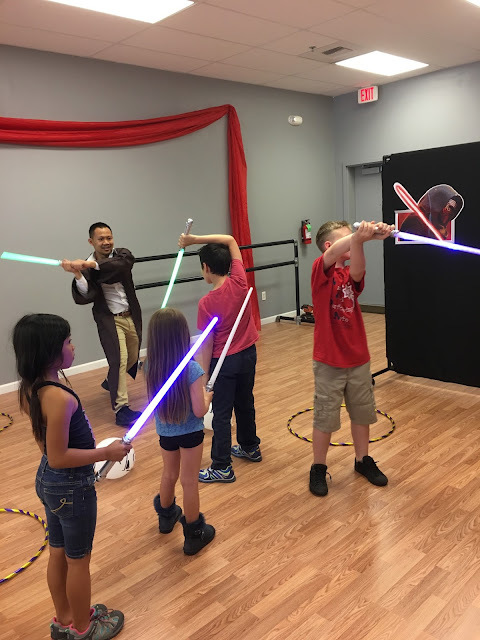 The event went over so well that they added a Lightsaber Class to their program, one for kids 7-12 and one for teens and adults. This is definitely a good minimum age since my youngest (4) is not coordinated or focused enough for this kind of choreography especially with the props. My oldest son has been taking Lightsaber Class for 3 weeks and the class has been added to the fall class list! Sometimes there have been other kids in his class and once he's been on his own in class. We (really mostly I) would love to have more people join him so that he can meet new people and have friends to chat with. He's been having a great time with or without other kids. The kids are provided with a plastic light up for choreography and foam lightsabers when they do duels for fun. 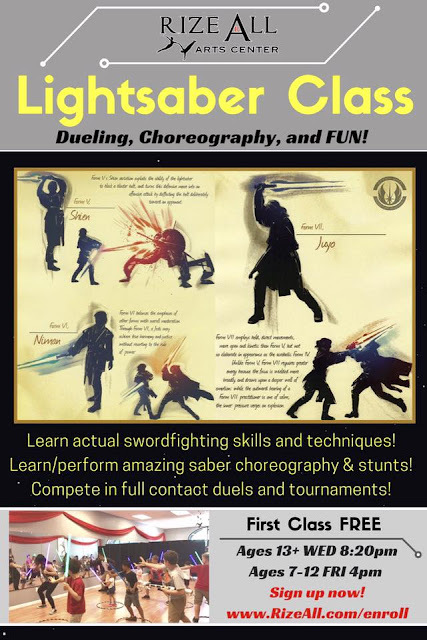 They learn real sword fighting techniques (with the plastic or foam lightsabers, of course) and stunts. It gives all the memorization and athletics of dance but still the geeky fun of Star Wars. It's perfect for my boy! If you are local, please come join us at the class! 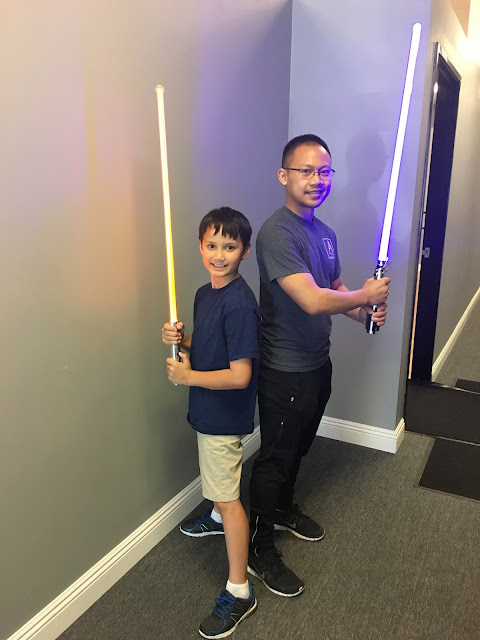 If you are not, then I sure hope you can find someone in your town that you can convince to give Lightsaber Classes to the children! What an awesome idea! My kids would love this! We did something similar at home but it would be so fun with an actual class! Oh my gosh, that is such a fun idea for a class for kids!